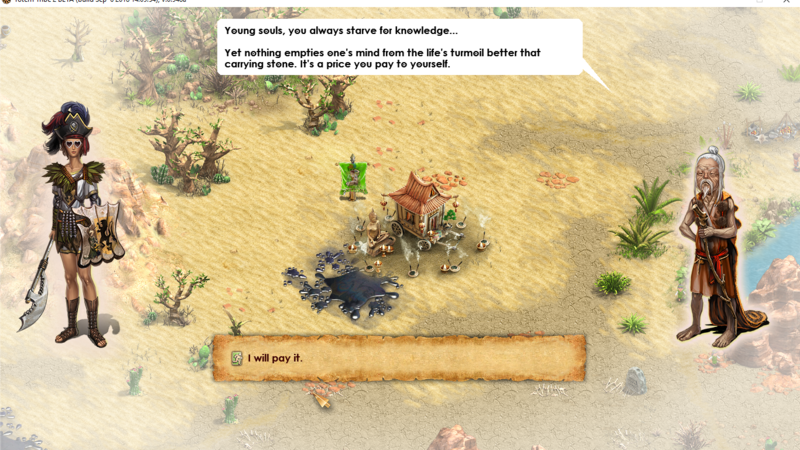 Today we have added a new traveling NPC which can visit your town, tell you Stories of Wisdom and help you meditate. Several updates ago we have split Church into two buildings - Church and Cathedral, making it impossible to reach level 50 in Medieval Age. Today's update fixes this issue. Travelling NPC called Mentor allows you to meditate without Altar, Temple, Church, or Cathedral. It still requires Figurines of Enlightenment and costs resources and may take more time, so use it only if you really need it. Additionally your hero can learn something from Stories of Wisdom this character can tell from time to time. Let us know what you think about this character. Totally unimpressed - used same number of figurines as normal plus a load of resources - only saving about 2 hours in levelling up time - so I cancelled. Figurines used were not returned. Would never have used it if I'd known - would have levelled up in normal way. Where it said it would only cost resources? When you ask him for a price he tells about resources as well as figurines in a popup. He didn't originally - or I would never have chosen the option. But he does now. Völlig unbeeindruckt - benutze die gleiche Anzahl von Figuren wie normal plus eine Ladung von Ressourcen - nur spart etwa 2 Stunden in der Nivellierzeit - also habe ich abgesagt. Die verwendeten Figuren wurden nicht zurückgegeben. Ich hätte es nie benutzt, wenn ich es gewusst hätte - hätte sich auf normale Art und Weise eingependelt. Warum kann ich nicht die deutsche Version spielen? There is such option in the conversation. I don't know, if it's a bug. I used the Mentor to level up, but while hero was in Meditation, he has gone. Hero continued to meditate, but at the end, she hasn't levelled up. So, figurines were lost. Is there a way to ensure, taht the hero could level up, even if the Mentor has gone? I had the same trouble : i lost 3 figurines of enlightment. My heroe meditate and Mentor was gone. 4 hours later, my heroe finished his meditation but no new level. Sad thing ... is Mentor a robber ? He came right back into my town and was able to get screenshots. It also does not mention Figurines at all or how long it will take. This is how all travellers work. In the first popup he tells you what are you missing. You have the figurines so he does not tell you how many of them you need. If you select option (Ask price) in the conversation, he will tell you the price in both stones and figurines. When you select this option to level up, it has text "whatever the price is" assuming you know the price or don't care about it. In the next update I will tweak the conversation a bit so the messages would be more simple and straightforward, but the principle will stay the same. Edited by berserker 7 months ago. I see in the screenshot above that the mentor is asking for 22200 is that a set cost for levelling up regardless of what level you are trying to achieve please? The reason I ask is that Ancestor's mentor is asking for 10800 stone and a figurine, there is no reference to me not having enough and I have 13000 stone and 19 figurines but I can't give them to him and there is no other dialogue option apart from asking the cost, finding out exactly how much xp I need for the next level and gaining xp through listening to his story so how can I give them to him please when clicking a figurine on him doesn't work and neither does clicking on the meditate button.